Final Lecture of the Season! 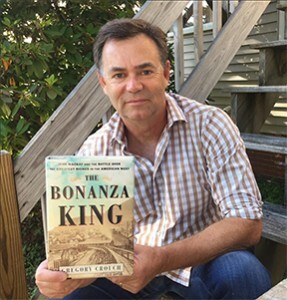 Gregory Crouch with “The Bonanza King” – John Mackay – Sold Out! This will be the final lecture of the 2018 Season with the Comstock Foundation for History and Culture! In his talk, Gregory Crouch will discuss local-legend John Mackay, who got his start in the United States as a destitute Irish immigrant brought here when he was 9 years old. 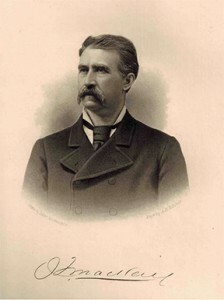 Mackay grew up in New York City’s Five Points slum (“The Gangs of New York neighborhood), came of age amid the violent mayhem of the California Gold Rush, and rose to the full power of his manhood in the deep, rich, and outrageously dangerous mines of the Comstock Lode beneath Virginia City and Gold Hill, Nevada, the ultimate Old West boomtowns. On the Comstock, Mackay worked his way up from nothing, battling the pernicious “Bank Ring” of California capitalists who’d monopolized the lode, and struck the legendary Big Bonanza, a stupendously valuable body of gold and silver ore buried 1,500 feet below the center of the town. The extraordinary wealth Mackay extracted from the Comstock Lode drove wild stock market frenzies in San Francisco and launched his wife, whose beginnings were every bit as humble as his own, on a meteoric social career among the finest European aristocrats. When John Mackay died in 1902—with a personal fortune equivalent to about $50 billion modern dollars—front page obituaries all over Europe and the United States hailed him as one of the most admired Americans of the age. Speaker/ Bio: Gregory Crouch is an author who specializes in adventurous and historic subjects. He has five major books in publication. He has published stores in The Atlantic, National Geographic, National Geographic Adventure, Smithsonian, Time, American History, World War II, Islands, Outside, Popular Mechanics, Backpacker, and many other national and regional media, and dozens of adventure stories for Rock & Ice, Ascent, Alpinist, and Climbing. In 1988, Gregory Crouch graduated from the United States Military Academy at West Point, New York, where he studied military history. He lives in Walnut Creek, in the San Francisco Bay Area of California.